I’m sharing a tag I’ve created using the current stamp of the week. Sooooo cute! I can’t help be a little bias towards this week’s stamp, it is my little design. Nothing better than a pitcher of beer with my hubs. I thought it would make for a cute little stamp. Now, this could be a pitcher of anything really… beer, sangria, lemonade, kool-aid. Your pitcher can be filled with anything. I used Distress Markers to watercolor this tag and created a little snippet if you are interested in watching my process. Adorable tag, and thanks for the video! The new stamp of the week is adorable and just in time for Feb 14th crafting! Love your tag! I love the stamp of the week AND, I LOVE how you coloured it. Great job! The tag is adorable! Such a cute tag. Love the way you coloured it. Love your stamp! Thx 4 a Great video! Adorable tag, love using distress markers to watercolor. I love the stamp you created! It’s so cute! Awesome tag you made with it. Thanks for the video and for sharing! Sweet tag for your hubby. Awesome tag. Love those puns! And thanks for the video; I always love to see how it’s done! Super cute stamp, and super cute tag! I like how you highlighted part of the sentiment. And nice to see your video of how it’s done! Yes Lisa, this tag is cute and your tag look gorgeous! I really do love that little pitcher! It’s neat how something so simple can be so wonderful! Ha, ha. Great little pitcher. Nice tag. So cute! 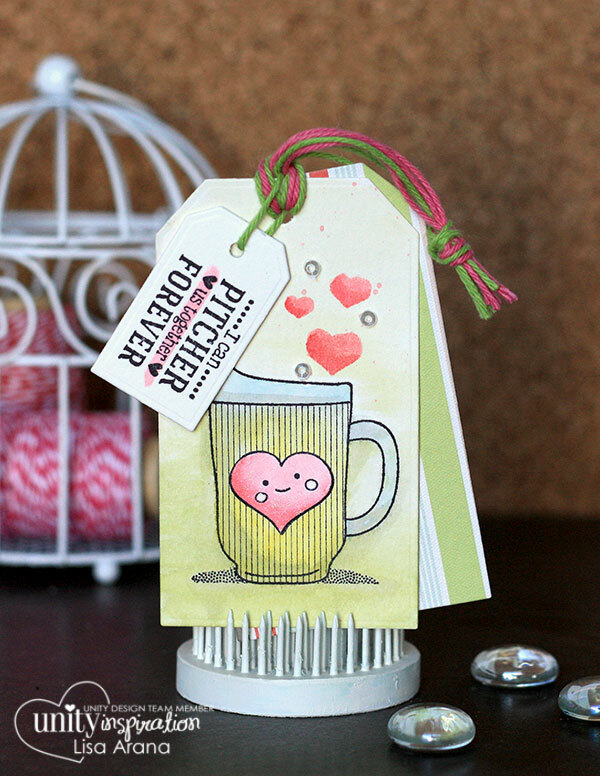 Love your tag and that darling pitcher stamp! Fun sentiment! So cute – love the pitcher with the heart. What an adorable tag!! Love it!!! Love your great tag idea. Ooh, this is so fun! I can PITCHER me a WINNER!! Can’t wait to participate in the challenge!! Fun tag, Lisa. Sweet new set! Love your wonderful card. That pitcher and sentiment are perfect. Thanks for sharing. Love all the pun stamps Unity is coming out with. Thanks for the video – great tag/card! ooh I just love the punny stamps from unity! This one is so cute! What an unusual stamp. Love your fun tags too. Darling tag. Love the mix of colors in the twine. Fantastic card! Thanks for the chance to win! Great video! Very cute tag!! I love that you list all th eproducts you use & a tutorial! Super cute tag! I love the cute pitcher and sentiment. Thanks for sharing. Oh Lisa this is soooo ADORABLE – your stamp is suuuper cute – LOVE it!!! Thanks for having me join you this time – you and your team are amazing!!! That comment above was from me, (-: Karin Åkesdotter! Great tag! Love the hearts you added to this! And the twine. Thanks for sharing.